The Panasonic ES8103S from the Arc 3 line is one of the top-selling electric shavers worldwide and for good reason: you get a lot of shaver for your buck. With a powerful linear motor, sharp blades, sturdy build quality and an affordable price, it’s easy to see why this particular shaver became a massive success. And even though it was launched all the way back in 2008, the ES8103S has aged extremely well and it’s still highly relevant today. Read along for all the meaty details in our comprehensive Panasonic ES8103S review. Wrapup — Who should buy the ES8103S ? We’ll kick off this test by quickly going over the most important features of the ES8103S. 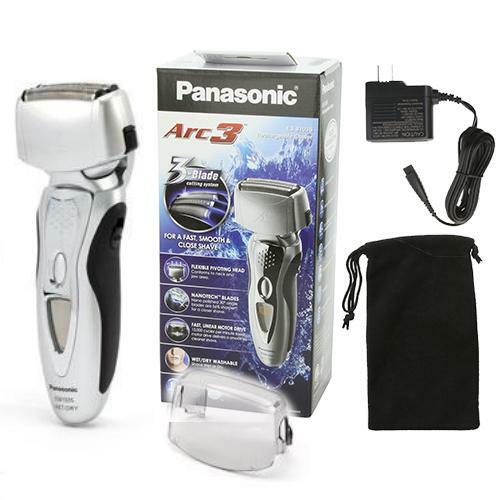 The Arc 3 is Panasonic’s entry-level range of electric shavers. As the name implies, the razors in this family come with 3 shaving elements. 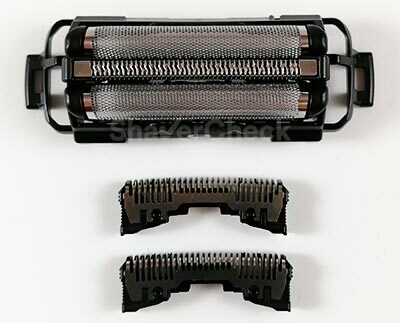 It’s the typical 3-blade foil shaver setup, with two outer foils and one slit trimmer. The foils cut hairs at skin levels, while the middle trimmer with its wider slots captures and trims down to size longer hairs. Almost all current Panasonic shavers come equipped with their trademark 30 degrees nanoblades. Precisely, the blades feature a very sharp bevel that provides a very clean and efficient cut, so you won’t experience any tugging or pulling. The three nanotech blades are actually two, the third one being integrated into the foil block itself. Apart from the obvious marketing purpose of this nanotech terminology, Panasonic’s aggressive 30 degrees bevel does make a difference and these blades are some of the best in the industry. The unit that powers this shaver is a fast, 13 000 CPM (cycles per minute) linear drive motor that provides a counter-directional move of the blades (ie they move in opposite directions) to reduce vibrations and noise. Speaking of noise levels, some may find the high pitch hum a bit on the loud side. 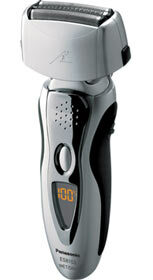 As all the shavers in Panasonic’s lineup, the ES8103S features a foil shaving system. The actual shaving head is made out of a perforated stainless steel foil that is slightly curved and covers the cutting blades. Panasonic calls it a multi-fit arc foil and states that it is designed to follow the contours of the face for maximum efficiency and comfort. The whole shaving block can be easily taken apart for cleaning by pressing the release buttons located on both sides of the foil frame. Another feature worth mentioning is the pivoting function of the shaving head, allowing it to swivel back and forth and also sideways. Having used Panasonic shavers for many years, I must say that I was never too fond of this feature on entry-level shavers as the flexing is usually very basic and jerky. There’s a whole different story with high-end models like Braun Series 9 or Panasonic’s very own Arc 5 line. 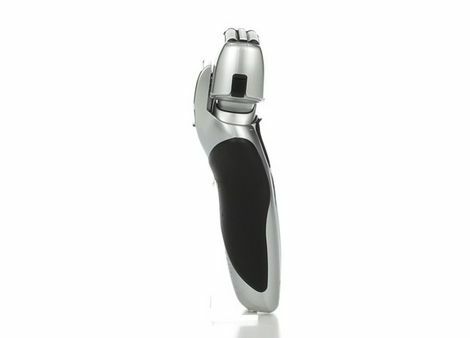 You have the option to lock the head into place with a switch located on the side of the main body for more precision when shaving tricky areas. A popup trimmer is a welcome addition to any shaver and the one we have here does a very good job, but there is one small caveat. Unlike the newer models, the trimmer sits lower on the back of the shaving head, so you can’t really see what you’re doing. What I found to do the trick is removing the foil frame and the two inner blades. It doesn’t sound very practical, but they’re really easy to remove and put together again. You can use the Panasonic ES81103S for dry or wet shaving, being completely waterproof and safe to use in the shower or with your favorite shaving cream. As it’s the case with most modern electric razors, the ES81103S can be used cordless. However, you cannot shave with it when plugged in, so if you forgot to charge it and the battery is dead this may come as a downside. Panasonic tried to compensate this shortcoming by including a quick charge option, which should charge the battery just enough for a 5 minutes shave. I can’t really consider this a downside as no wet/dry electric shaver can be used while charging as a safety precaution. 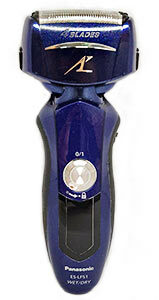 The build quality of Panasonic shavers has always been top notch and this one is no exception. It feels very sturdy and it looks like it can take a beating. It’s very comfortable in the hand, not too heavy and the grip is excellent. I also prefer this classier color scheme to the old blue of the previous generation (pictured below) that also lacked the curved profile of the foils. The ES81103S with its 3 blade shaving head is also very manageable and nimble, a lot easier to use than an Arc 4 or 5. This makes it ideal for beginners. As for downsides, it doesn’t have a travel lock like the newer iterations of the Arc 3 line. With a fully charged battery, you should have enough power for 45 minutes of use. Charging the ES81103S takes about an hour. The automatic voltage conversion feature means that you will be able to use it anywhere, as it adapts to any electrical outlet in the world. The LED display has a few, but useful indicators, like the percentage of battery power left and it also displays a notification when the shaver needs to be cleaned. The fact that it shows the battery level in 10% increments is really impressive for a shaver in this price category. For example, a Braun Series 3 will only feature a 2 or 3-level LED indicator. The more expensive Panasonic models come with an automatic cleaning and charging station. In order to keep the price low, this shaver doesn’t have one. However, cleaning the ES81103S is very easy: you can rinse it directly under warm tap water or for a more thorough cleaning you can use a bit of liquid soap or shower gel and then start the Turbo Mode for cleaning by pressing and holding the ON/OFF switch. This increases the motor’s speed from 13 000 to 17 000 CPM, creating vibrations that get rid of any debris and hair clippings stuck inside the shaving head. After that, rinse the shaver thoroughly, shake off excess water and let it air dry completely. If you use soap to clean it, you should also lubricate the blades regularly with a bit of light oil or a spray lubricant. And now let’s see how the ES81103S fares in terms of actual shaving performance. For the majority of potential buyers, this is the decisive part when choosing an electric shaver. It all comes down to a solid shaving experience regardless of all the neat features. I’m glad to say that the Panasonic ES8103S will be an excellent shaver for most users. In fact, I would even say that it’s probably the closest shaving entry-level electric shaver. For the purpose of this review, I specifically compared it side by side with its direct competitor, the Braun Series 3, and when it comes strictly to closeness, the Panasonic clearly wins. With the ES81103S you’ll get a very close and adequately comfortable shave. Even if you have a medium to coarse beard, this shaver will have no problem in delivering a smooth and close shave. Now, if you have very sensitive skin, the Panny may be a bit too aggressive and even get a bit too warm. This is a downside of that closeness. However, with the addition of a pre-shave or even shaving cream if you’re into wet shaving you’ll have no problem in getting a perfectly comfortable shave. The only areas where the ES81103S will struggle a bit and will require additional passes are the neck and jawline, especially if you have longer hairs that grow in different directions. In this case you’ll have to change the direction of the strokes and always go against the grain. This can increase the time it takes to complete your shave. However, most electric shavers have difficulties in this situation. The Panasonic ES81103S will work best on short facial hair, so it’s recommended to use it more often in order to get the best out of it. That’s pretty much it, overall the ES81103S punches way above its price and would make an ideal everyday shaver. Being a budget shaver, at least with regards to its price tag, this Panasonic doesn’t come bundled with a lot of goodies. You will only get an AC adapter, a protective plastic cap, and a travel pouch. Which isn’t necessarily a bad thing, as for a lot of people this is really all they’ll need. I would have liked to see hard travel case or at least the faux leather one that Panasonic includes with some of their other shavers, but it is what it is. The price of the replacement parts is pretty reasonable, but they are more expensive than the ones for similarly priced Braun shavers, like the Series 3. You’ll definitely get a lot of shaver for the money as the ES8103S incorporates the same technology like other more expensive shavers from Panasonic: same motor, same blades, same foil. The price is kept low by not including a cleaning system and other features like beard density sensors or travel lock. If you are looking for a reliable, inexpensive and very capable shaver you can’t go wrong with this one. It works particularly well when used for shaving daily, but you can also get great results shaving every other day if you have a slower beard growth. Since it’s very easy to use and to clean, it will also make a great choice if you’re just getting started with electric shaving. You should definitely shortlist the ES81103S, particularly if you can find it at a nice discount. The first obvious choice would be its direct competitor from Braun, the Series 3. 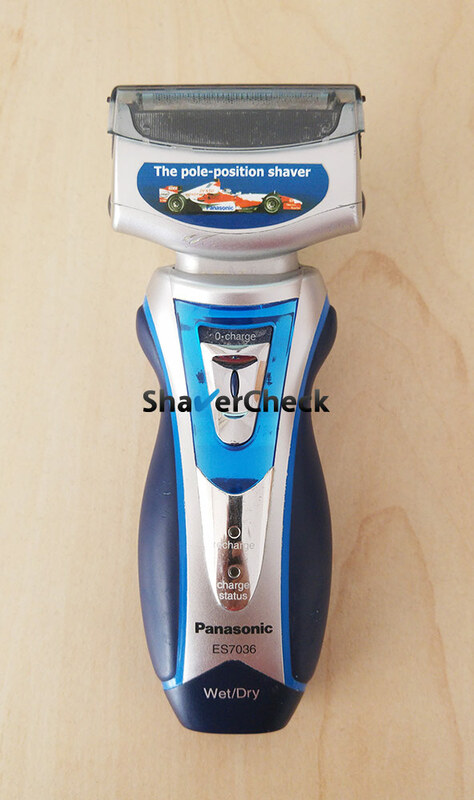 As I said in my detailed comparison of the two, I find the Arc 3 line from Panasonic to outperform the shavers from the Series 3 when it comes strictly to the closeness of the shave. While the Arc 3 is more powerful and shaves faster and closer, the Series 3 is more comfortable out of the box. So if you suffer from sensitive skin, the Series 3 from Braun is probably a better option. The Series 3 is also a bit better at catching longer, flat-lying hairs than the Arc 3, so that’s another thing to consider if you don’t shave as often. My pick would be the 3040s ProSkin that I reviewed here. It is suitable for wet/dry operation and it’s inexpensive. Finally, for just a few dollars more you can go for a Panasonic Arc 4 like the ES-LF51-A. 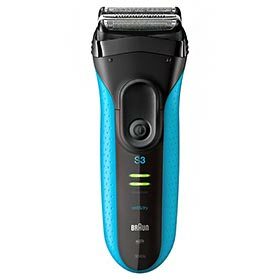 As I said in my review, this one has an additional cutting element, has an even more powerful 14 000 CPM motor and offers excellent shaving performance. It also comes with a faux leather travel case. I would personally spend a few dollars more and go for this one instead of the ES8103S. Brilliant insights. Thanks for the tips. Thanks for your comment, Jay. Glad you found the information useful.